Well, I haven't posted a count update since 1,000, so I figured I would make an update now that I have hit 2,500 views. Many thanks to all of my repeat viewers that subscribe and keep coming back. I also hope that some of you that have come here through search engines will keep reading and suggest new posts if there is anything you have questions about. Thanks for reading, I'm looking forward to the next 2,500 views. 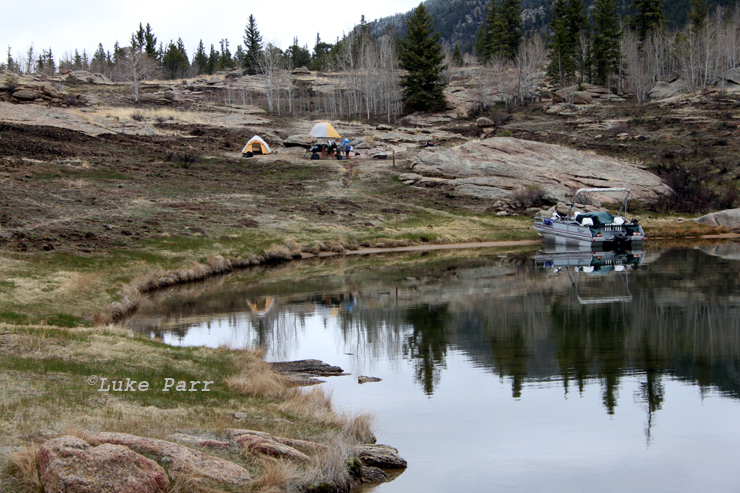 Well, we made it back from Blue Mesa Reservoir, we spent five nights and just as many days out on the water. Thanks to tips from some of the locals we were able to catch Rainbow Trout, Kokanee Salmon and Lake Trout. I will post some pictures and more information about the trip soon, for right now we need to finish unpacking. When my family and I went to Chatfield Reservoir the last time, my son accidentally threw his fishing pole over the boat. It was an inexpensive "Cars" pole that supposedly floats. Well, over the couple years that he used it, the floating handle cracked. When the pole went over the edge of the boat it slowly sunk as the air drained from the handle. I tried to hook it with my lure, but couldn't get it fast enough. That whole experience made me think of a fishing pole float that I had seen advertised in some catalog, but I couldn't remember where. Since we are going to Blue Mesa Reservoir tomorrow, I figured I would try to make my own fishing pole float for the kids. I started by buying a simple children's float tube from the dollar store. 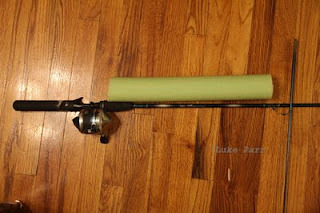 I cut it down to fit between the reel and the first guide. 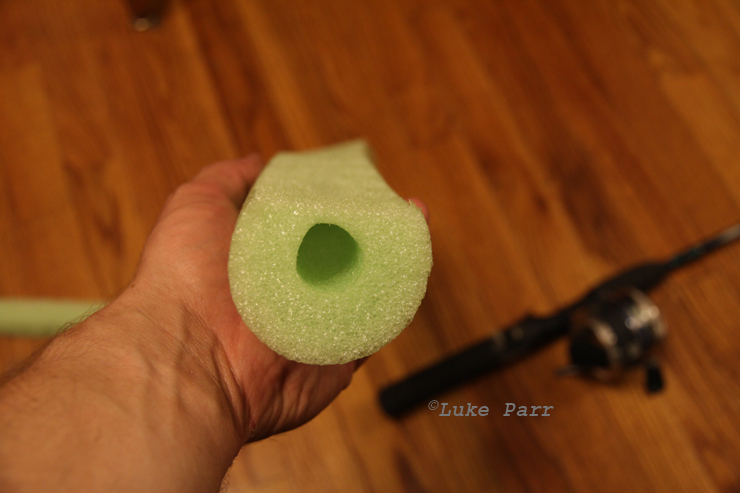 With a piece of the tube cut down to fit on the rode I sliced a line through the tube allowing it to go around the pole. I also shaved one side of it flat to allow clearance for the fishing line. You can see in the photo below that it wasn't the fanciest work. Shaving one side for the fishing line. Below is the final product. I used some packing tape to secure the float around the pole. My concern is whether or not the float will fully support the fishing pole in the water. Before we head out on the boat at Blue Mesa, we will test the float in a shallower area. 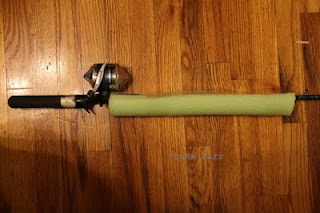 Have any of you made or tried a fishing pole float? What were your thoughts about it? I'll make sure to update with how it works when we get back. After writing this blog for a couple months I have decided to break up the subjects a little bit. It seems like I get certain viewers for the different topics, but not all of my viewers are interested in all of the topics that I write about. As a result I am starting by creating another blog just for geocaching. The new blog, Geocaching Colorado will focus just on subjects relating to geocaching. I will be moving my posts from this site over there over time. For know I will leave the posts here, but the links in the geocaching tab will link to the new site. There are many, many ways to sell photographs. They range from selling portraits to individuals, to suffering a boring job. So if you take great photos, but have never made a penny on your photography, how to you get started? businesses trying to produce multimedia presentations, to online sales. While dozens of articles could be written about different methods, in this post I want to address one in particular, using a Microstock Agency to sell your photos. When companies are in need of photographs, for anything from advertising campaigns to in house power point presentations, they need a way of obtaining those photographs. 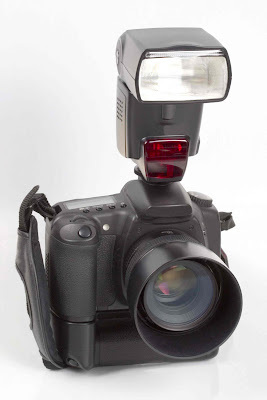 The original way was to hire a photographer to take specific photos for the need at hand. While there is still a need for this, especially on very specific or rare topics, many subjects are more common. The other option is to just copy the photo from somewhere else online, but that would be illegal. 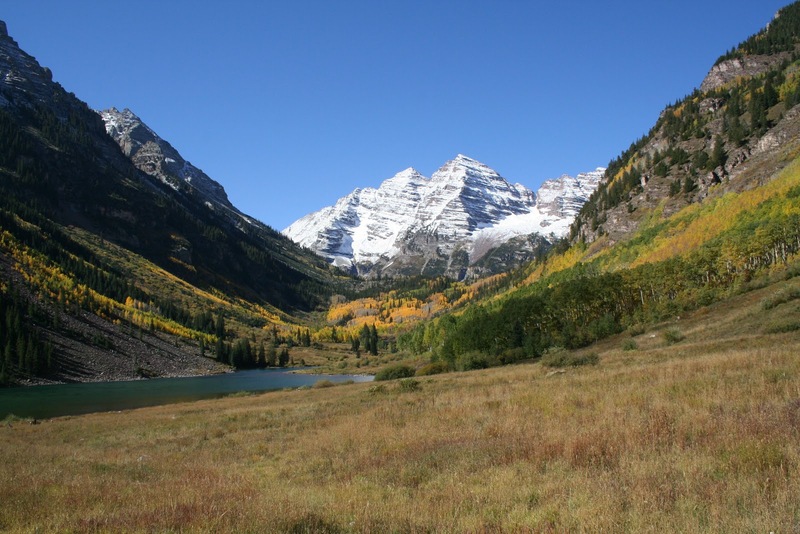 Let's say that an outdoor clothing company wants to use a picture of Maroon Bells in an ad campaign. Maroon Bells are photographed regularly, if you have ever been to a gift shop in Colorado, you have probably seen dozens of postcards featuring Maroon Bells. So why hire a photographer to go take photographs of that mountain range, when there are more than enough photos out there, from all seasons. Stock photography companies maintain a database of photographs that can be "purchased." I used quotation marks around purchased to emphasize the actual transaction. Typically a company would pay to use the image, but there would be a contract that specifies how the image can be used and how long it can be used for. Outside of the contractual use, the company would have to pay to use the image again. Typically stock agencies charge a fairly large fee for the royalties to an image. Because of the costs associated, traditional stock agencies typically cater to larger companies. Micro stock agencies evolved to provide stock photos to a broader customer base. Instead of costing hundreds or even thousands of dollars, micro stock photos are often offered for just a few dollars. They also typically allow the purchaser to use to photos indefinitely and for more applications than just a single use. This makes photos easier to use and more available to the average user. Now a smaller company can use photos, or a blogger can afford to buy that perfect image that compliments their post. How Can I Make Money With Micro stock? The bigger micro stock agencies have databases with millions of images. To continue to provide up to date, interesting photos for their customers, micro stock agencies rely on contributors to add those photos. Some micro stock agencies are harder to get accepted into, but with a little research, practice and patience, you could start seeing your images for sale. Most microstock agencies have some sort of application process. This usually starts with creating an account (which is typically free). They are of course hoping that once you have an account, you will want to purchase photos from them, but instead of buying the photos, you will add photos for others to buy. Once you have created an account you may have to submit some sample photographs before you can be accepted as a contributor. If these images are rejected, don't take it personally. The larger microstock agencies already have large databases with photographs. They don't want just another picture of your dog, or Maroon Bells. They want photographs that are technically perfect, yet unique. When you are selecting photos to submit as an application process, make sure that the photos are properly exposed, with good lighting and focus. Also, if the agency requires ten application photos, try to offer them ten different photographs. This will demonstrate that you have more range and experience than ten photos of your dog would suggest. What if the microstock agency rejects my submissions? If the agency rejects the phots, or some of the photos that you submitted, use it as a learning experience. It took me two tries to get accepted at Istock, usually when they reject images they will give you some reason as to why they made that decision. Use that criticism to benefit you when you go to choose your next photos for submission. Once you are accepted to a microstock agency you get to start uploading photos that will actually be available for sale. These images will still be inspected, so don't skimp on the quality. Take the time to examine each image for exposure, focus, name brands and anything else that will detract from the quality. The inspection period can last anywhere from a couple hours to several weeks, depending on the agency. It is easy to check every day to see if your images have been approved, but try to use that time to take more photos and get them ready for submission. A Digital SLR, the backbone of stock photography. ﻿ More photos equals more sales. This point may seem obvious, but the search algorithims that are used by many of the top microstock agencies tend to favor newer images and those that have sold well. If you have a portfolio of only a few images and you only upload a couple new photos a year, believe me, I've been there, you won't make as much money, because your photos won't be seen as often. As you upload more and more photos, the search algorithims will pick up your images and buyers will be more likely to see them. Another advantage is that if someone likes one of your photos, but it doesn't quite fit their needs, they might be more likely to look at other images in your portfolio. Whenever I take a break from uploading photos I see a drop in sales. When I start uploading more photos I start to see an increase. The size of your portfolio isn't the only thing that matters, it is important to add fresh, new content to attract new intrest. This ca be the hardest part for me. As I mentioned above, volume plays a huge role in success in Microstock photography. If you're like me at all, it can be hard to continue to come up with new ideas and concepts to photograph. While I wouldn't suggest copying another photographers work, you can certainly research what topics are selling well and try to use those as inspiration to create something new ad unique. Hopefully after reading this post you will have a little better idea of what is involved in the Microstock industry and that should help you decide if it is for you. I will post some links to some of the Microstock agecies that I contribute to, they aren't the only agecies out there, but they are some of the larger companies. Let me know in the comment section below if you have any tips or advice of your own. Also, if you decide to sign up with an agency, let me know how it goes. Good Luck!!! The next lake that I wanted to talk about is one that I have never been to as an adult. 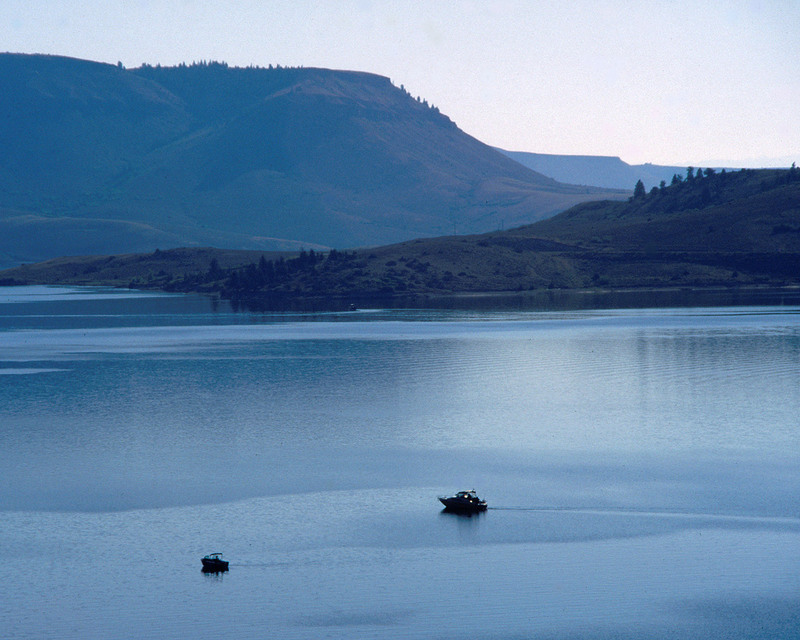 Blue Mesa Reservoir, part of the Curecanti National Recreation Area, is Colorado's largest lake. 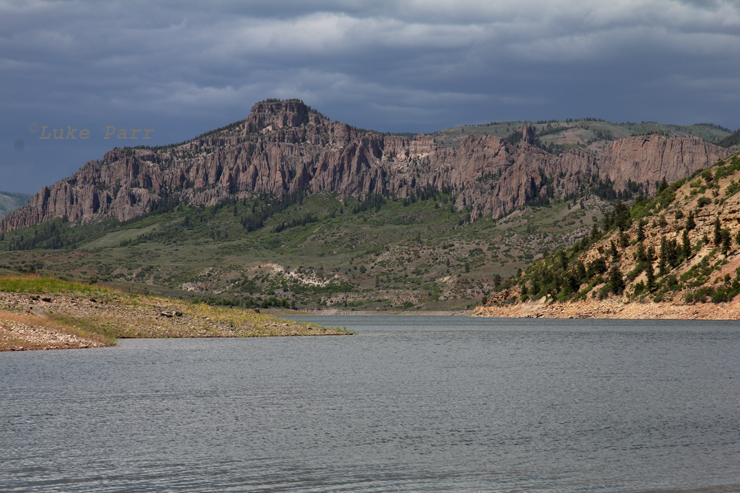 At twenty miles long and offering 96 miles of shoreline, Blue Mesa Reservoir has plenty of space for boating, fishing, camping or just enjoying the great outdoors. Next week, my wife and I are planning a camping trip to Blue Mesa and I figured it made sense to write a little bit about it now, and hopefully once we get back I will be able to share more about the fish we caught and how the camping was. Blue Mesa is south west of Gunnison, Colorado. It is near the famous Black Canyon of the Gunnision National Park. Blue Mesa is the largest Kokanee Salmon fishery in Colorado, each year millions of salmon eggs are collected from the Roaring Judy hatchery located at the inlet to Blue Mesa and distributed all over the state for stocking salmon. 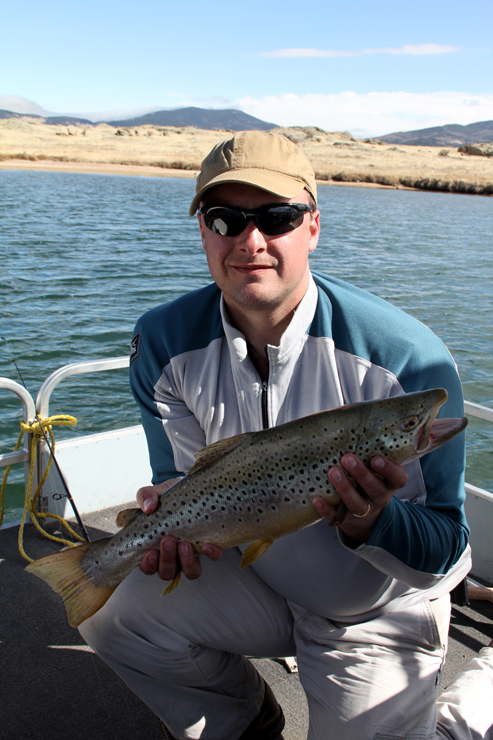 Blue Mesa is also one of the best Lake Trout fisheries in Colorado. In 2007, Blue Mesa supplied the Colorado state record lake trout, which weighed 50.35 pounds and measured 44.25 inches. Blue Mesa offers plenty of camping opportunities as well. With over 360 camp sites spread across numerous campgrounds as well as back country sites, perfect for boat in camping. The best part of the back country sites are the fact that they are free. You are also allowed to camp along much of the southern border of the lake as well as Red Creek Island. The park is free to enter, but there are nominal fees for boat use. For more information, check out the Blue Mesa Reservoir official site. Also you can check out the live feed from the park here. Don't forget to check back to see how our trip went. Let me know your experience with Blue Mesa in the comment section below. ﻿Eleven Mile State Park is located off of highway 92 near Lake George, Colorado. 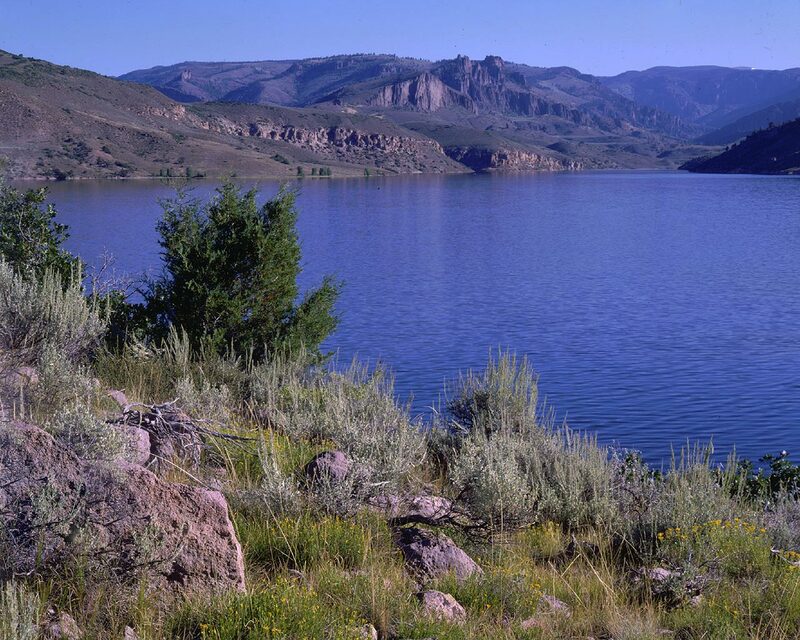 This large reservoir offers camping, boating and fishing in the South Park area. Eleven Mile State park's large lake is a popular fishing and boating destination, but thanks to its size, there is almost always room for another boat. This lake offers fishing for Rainbow and Brown Trout, Kokanee Salmon and Northern Pike. Carp are often seen cruising the shallows and you can try to catch them using a fly rod, or by bow fishing. Nearby is Spinney Mountain Reservoir, which is one of Colorado's Gold Medal lakes, offer a chance at trophy sized trout and Pike. Eleven Mile State Park has a marina on site that offers supplies and boat rentals.